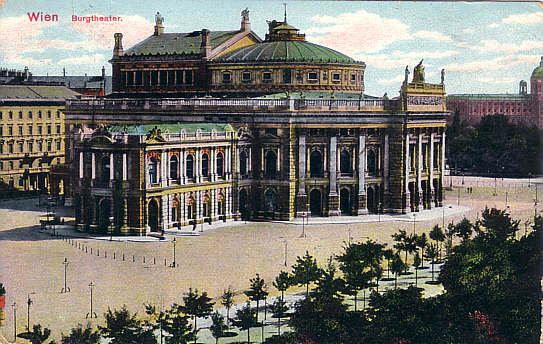 Built 1874-1888 as "K. k. Hofburgtheater" by Karl Hasenauer and Gottfried Semper, as a successor to the first Burgtheater (built 1741 at another site, demolished 1888). 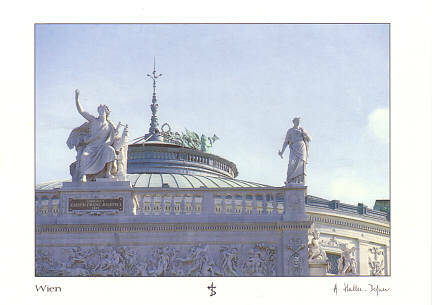 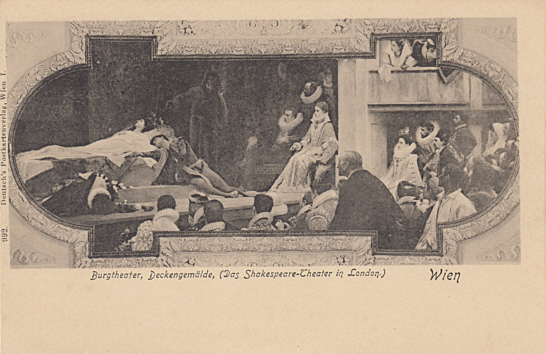 Opened 14 October 1888 with Franz Grillparzer's "Esther" and Schiller's "Wallensteins Lager". 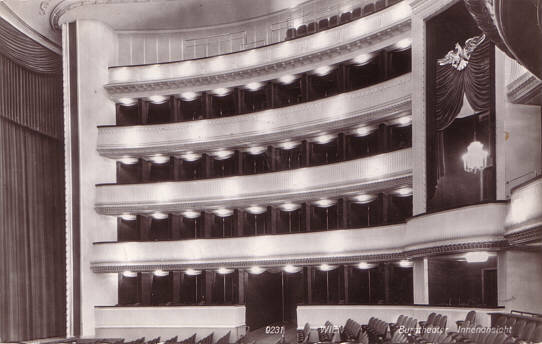 1897 layout alteration of the auditorium boxes. 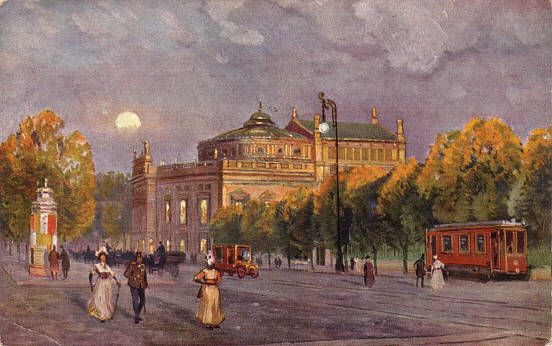 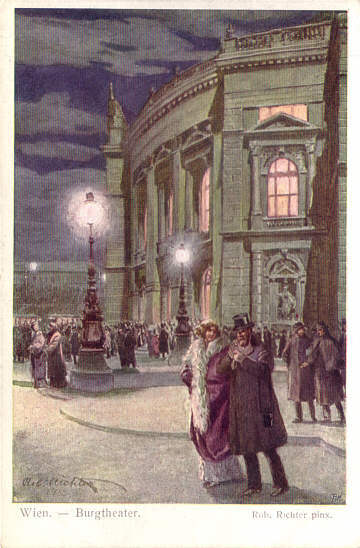 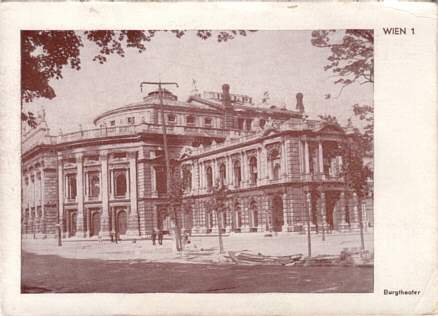 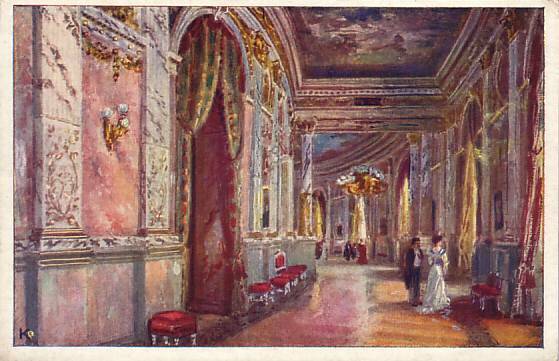 1919 renamed "Burgtheater". 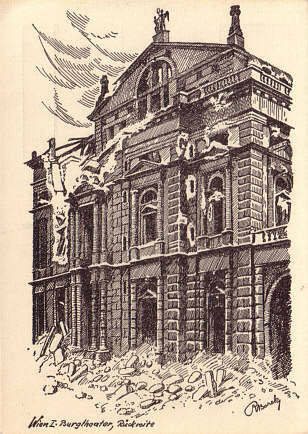 Destroyed by bombs and a fire in 1945. 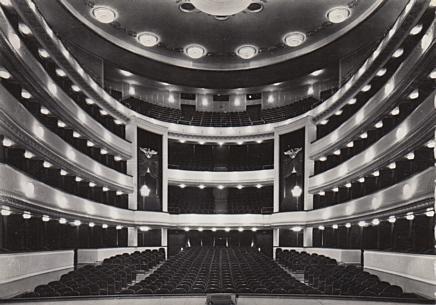 1953-1955 rebuilt to the original plans. 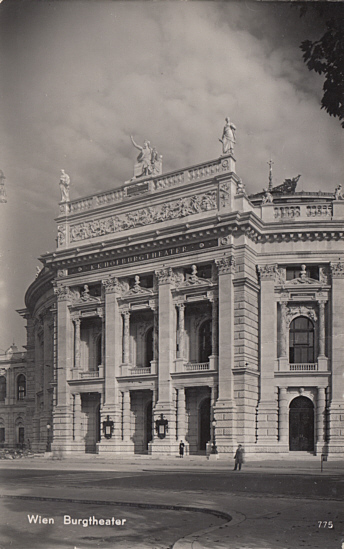 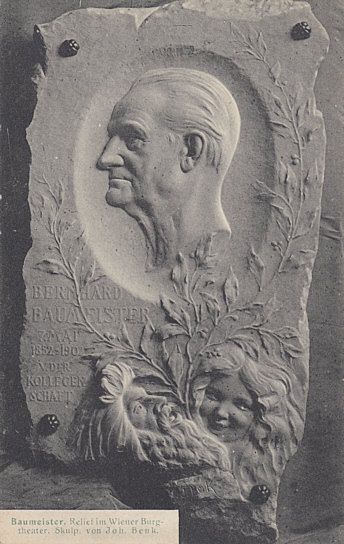 Re-opened 15 Oct 1955 with Grillparzer's "König Ottokars Glück und Ende". 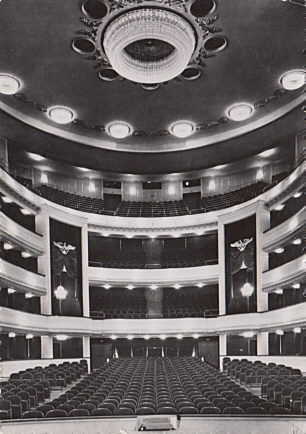 1897: 1532 seats, today: 1313 seats. 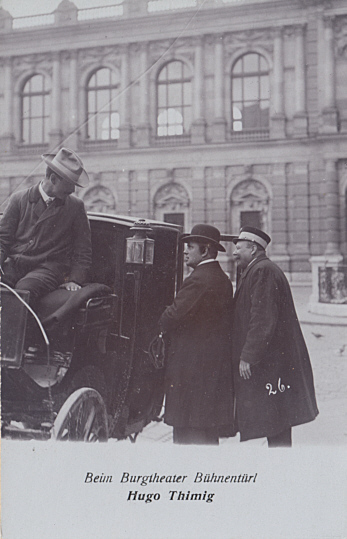 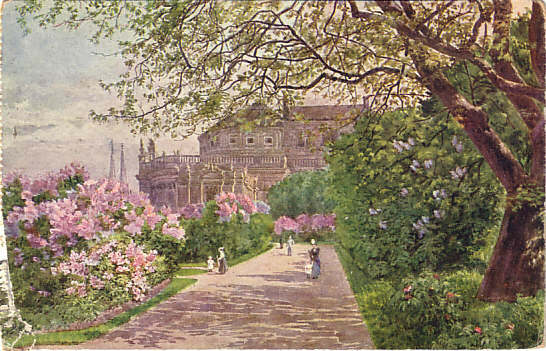 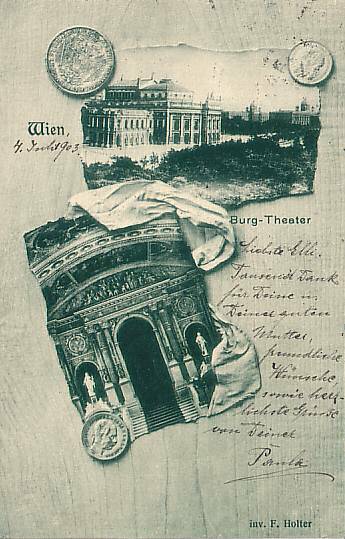 Front Text: "Wien. 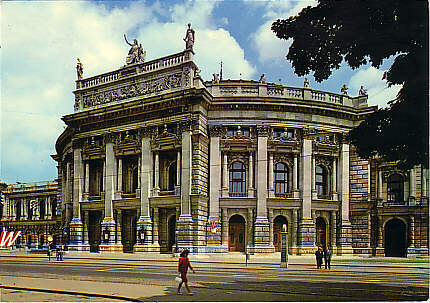 K. K. Hofburg-Theater"
Front Text: "Wien - Burg-Theater"
Front Text: "Stiegenhaus im k. k. Hof-Burgtheater, Wien I." 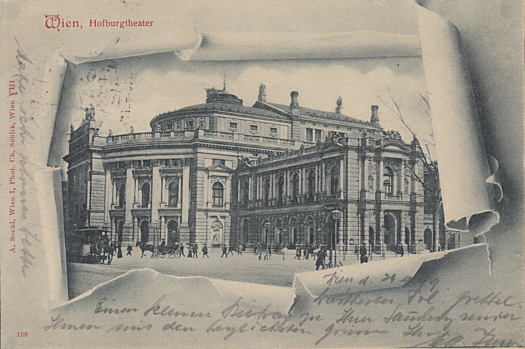 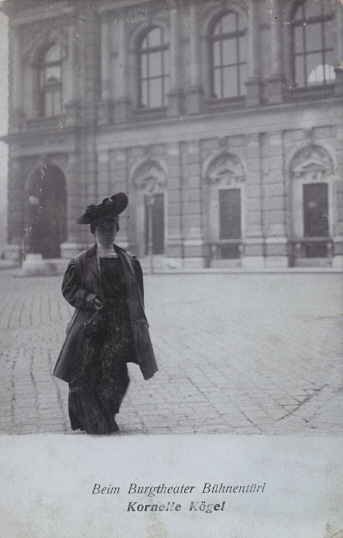 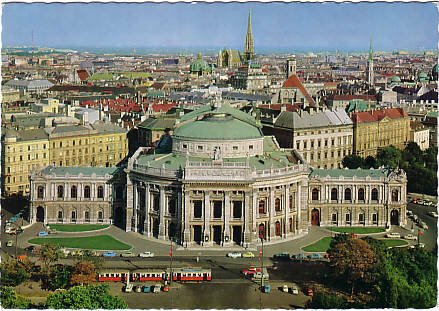 Reverse Text: "Wien - K. K. Hofburgtheater"
Reverse Text: "Wien - Burgtheater, Rob. 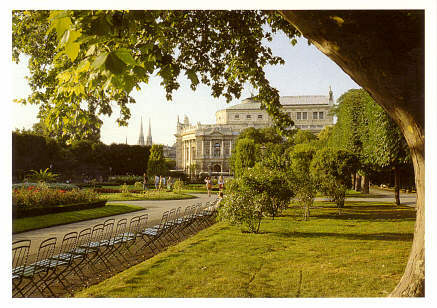 Richter pinx." 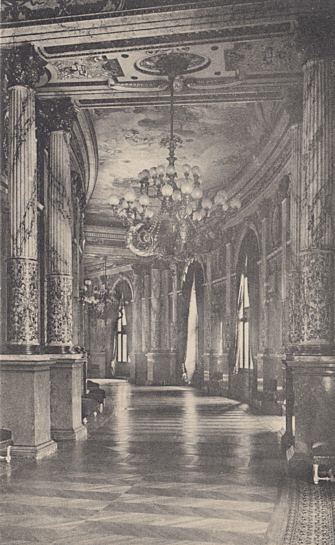 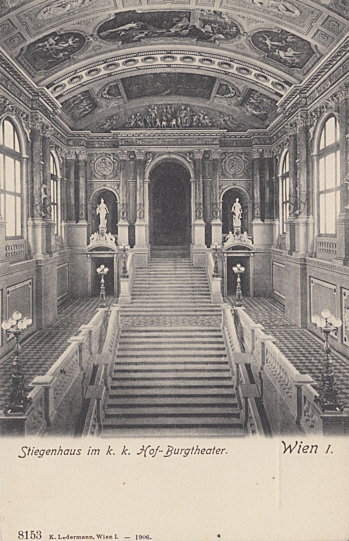 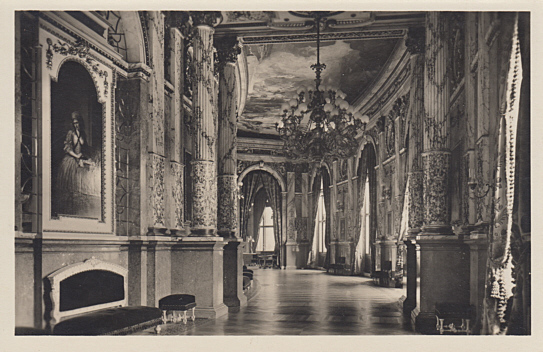 Reverse Text: "Wien - Burgtheater-Foyer"
Front Text: "Wien - K. k. Hofburgtheater"
Front Text: "Wien - Burgtheater"
Reverse Text: "Wien I. 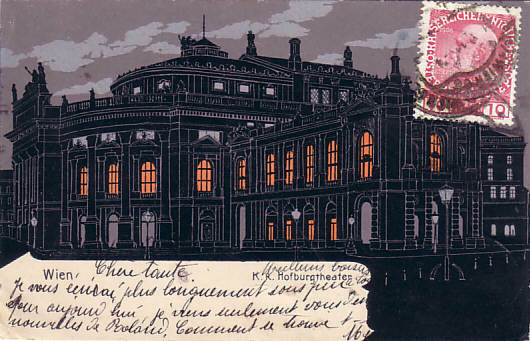 - Burgtheater mit Volksgarten"
Reverse Text: "Wien, I. Foyer im k. k. Hof-Burgtheater"
Reverse Text: "Wien I. Burgtheater, Foyer"
Reverse Text: "Baumeister. 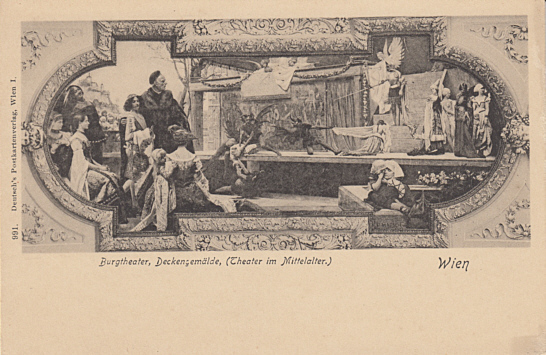 Relief im Wiener Burgtheater. 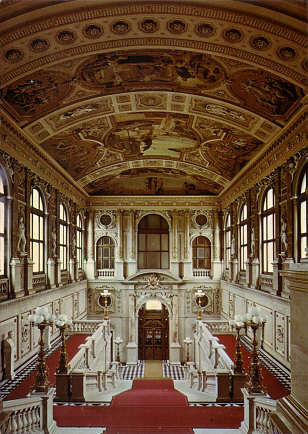 Skulp. 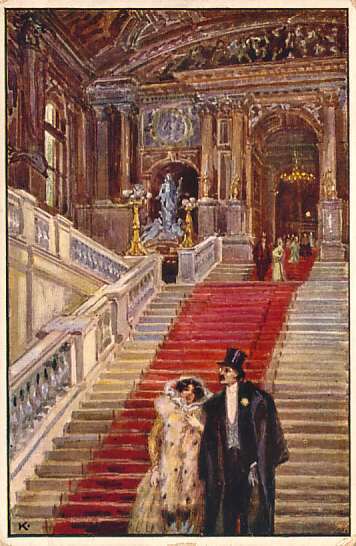 von Joh. 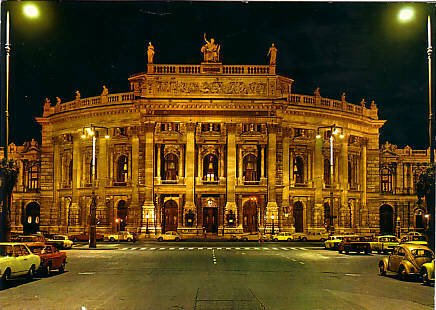 Benk." 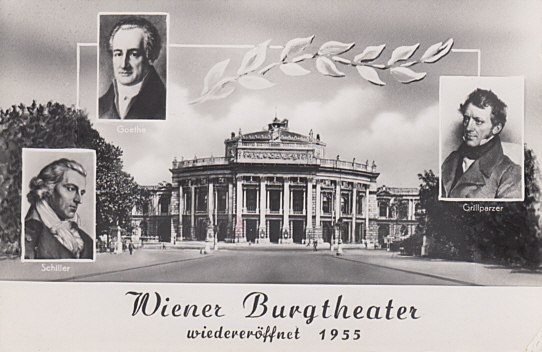 Front Text: "Wien 1, Burgtheater"
Reverse Text: "Aus der Serie 'Verwüstetes Wien', Wien 1, Burgtheater"
Front Text: "Wien I, Burgtheater, Rückseite"
Front Text: "Wiener Burgtheater wiedereröffnet 1955"
Reverse Text: "Wien, Innenaufnahme des wiederhergestellten Burgtheaters; Vienna, View of the Interior of the Burgtheater rebuilt; Vienne. 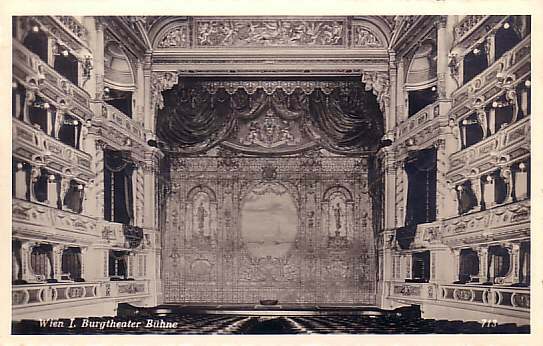 Intérieur du Théâtre de la Burg, reconstruit; Vienne, Interiore del teatro della corte, rinnovato." 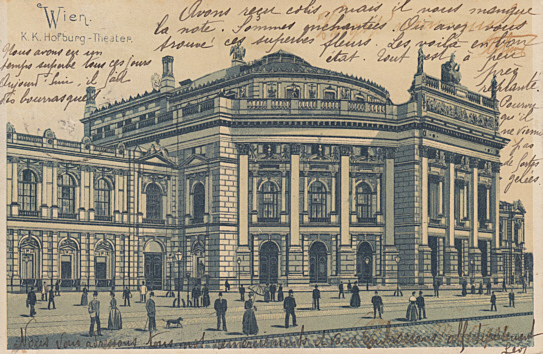 Front Text: "Wien, Burgtheater, Blick auf Zuschauerraum (Fassungsraum 1520 Personen)"
Front Text: "Wien, Burgtheater, Innenansicht"
Reverse Text: "Wien, Panorama, Burgtheater - Vienna, Burgtheater - Vienne, Théâtre de la Burg - Vienna, Teatro della Corte"
Reverse Text: "Wien 1, Burgtheater, traditionsreichste deutschsprachige Bühne, erbaut 1874-1888 - Vienna 1, Burgtheater, a theatre of ancient tradition for performances in the German language, built in 1874-1888 - Vienne 1, Burgtheater, théâtre de très ancienne tradition pou représentations en langue allemande, bâti en 1874-1888"
Reverse Text: "Wien - Vienna - Vienne, Burgtheater"
Reverse Text: "Wien - pastell - Burgtheater"
Reverse Text: "Volksgarten, Blick auf das Burgtheater, Wien"
For other postcards of this theatre, see Wien: Cards showing various theatres.